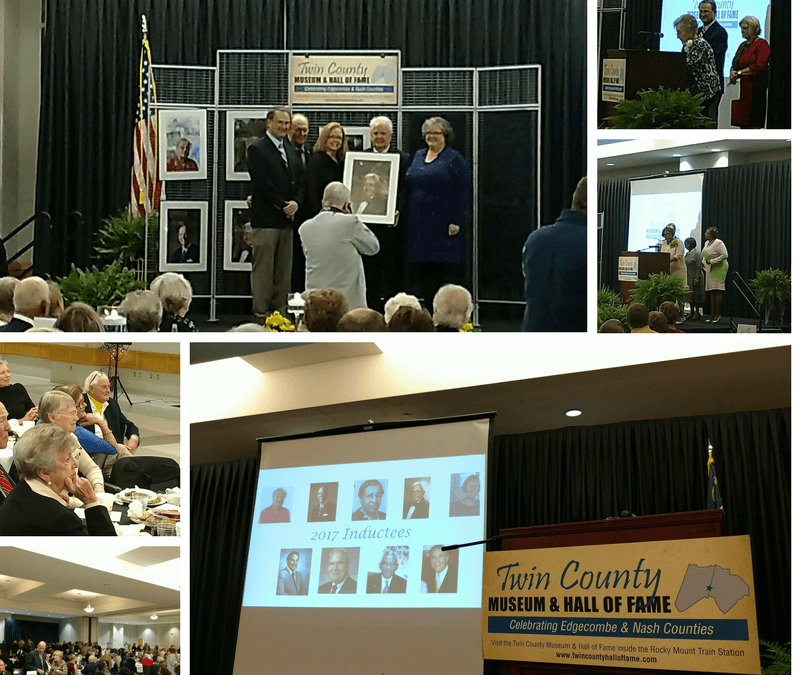 We had the honor recently of induction a new class of members to the Twin County Hall of Fame in Rocky Mount, North Carolina. It was an evening filled with respect and joy. Nash County, has persevered and succeeded in challenging circumstances. At 92, she continues to be a pioneer and role model for her family, friends, and community. At eight years old, after both her parents passed away, Mrs. Bailey was sent from her home in Nash County to the Oxford Orphanage. However, she always considered this area her home and returned after finishing her education at Atlantic Christian College. In 1948, she and her husband, Clyde C. Bailey, Sr., co-founded Bailey’s Jewelry in downtown Rocky Mount where she worked while raising two children. After 15 years in business, Mr. Bailey died, making Mrs. Bailey, at 36, the sole owner and operator of the company. Mrs. Bailey, with her hardworking, never-give-up attitude, overcame many obstacles, obstacles which many thought would surely make her fail. To doubters, her response was simply, “They do not know this girl!” She worked at Bailey’s Jewelry six days a week and did the books on Sunday afternoons after church. Today, along with her children Clyde, Jr., and Cindy, Mrs. Bailey – also known as “Mama Ann” -has expanded Bailey’s to four locations in North Carolina over the course of almost seventy years. Among her many accolades, Mrs. Bailey was honored in April 2017 with the “Triangle Business Journal’s Women in Business Award.” In true “Mama Ann” style, her two-minute, simple but powerful, acceptance speech received two standing ovations from a young, enthusiastic audience. She also was featured in “Our State Magazine” in December of 2014. Finally, her Christian faith has always been important to her. She is a charter member of Edgemont Baptist Church and is a member of The Eastern Star. A successful businessman, Tom founded Betts & Company, Insurors and later became Senior Development Officer for RBC Centura. He shares his business acumen acquired from 40 plus years in the property and liability insurance fields on the boards of many major organizations. Notably, Tom was a Founding Director of First Carolina Bank and The Rocky Mount City Club. Also, he was a board member of The Planters National Bank Corporation and First Carolina Financial Services. Anna Easter Brown, born on Easter Sunday of 1879, was a spokeswoman for educational literacy, preservation of Black History, women’s rights, and equal rights for African Americans. In 1909, Ms. Brown graduated from Howard University in Washington, DC, at a time when only a third of one percent of African Americans attended college. In 1908, while attending college, she was one of nine founding members and first treasurer of the first African American sorority in the United States, Alpha Kappa Alpha Sorority, Inc. Sorority membership numbers more than 290,000 worldwide. She was later a charter member of the Chi Omega Chapter of Alpha Kappa Alpha in Rocky Mount and was a charter member of the Rocky Mount YWCA. Ms. Brown also earned her graduate degree in social studies from Columbia University. She was a North Carolina social studies teacher for more than 50 years, first at Bricks Junior College in Bricks, North Carolina, then Lincoln High School and then at Booker T. Washington High School in Rocky Mount. She was dedicated to advocacy for African Americans and contributed countless hours to actions that would foster their advancement. Ms. Brown annually displayed a black history exhibit and traveled around the country to show it to other communities. In 1951, her exhibition received national attention during its 25th anniversary and featured in “Opportunity,” a magazine published by the National Urban League. Her exhibits helped to expand the discussion of Black History not only at Booker T. Washington but in the Rocky Mount City Schools. Ms. Brown served as an advisor to young people. She was an avid tennis player and taught the sport to many young people in the area. She was also active in the NAACP, North Carolina Teacher’s Association, American Red Cross, and the Tuberculosis drive. She served faithfully in several ministry positions at Holy Hope Episcopal Church on Ivy Street in Rocky Mount where she was a member for 30 years until her death in 1957. James “Jim” Russell Dickens Sr.
Mr. Dickens was passionate about education. He served on the UNC Board of Trustees and the UNC Alumni Board of Visitors. A hearty “Go Heels!” was never far from his lips. He served on the NC Wesleyan College Board of Trustees for 18 years and as trustee emeritus. He was chairman of the Bishops Club, the Board of Visitors and a member of the James M. Johnston Fellowship Program. In 2015 he received the Algernon Sydney Sullivan Award from Wesleyan. Fund. He helped form the Down East Radio Reading Service. He was proud to bring the ACC golf tournament to Rocky Mount in the 1980s and 1990s. It’s said if there was anything “good” going on, Mr. Dickens was involved. His heroes ranged from university greats like Bill Friday and Dean Smith to the man collecting cans along the streets to make a living. Mr. Dickens was a humble man, but a hero to many. Jim died in August 2017, but his legacy lives on as the initiator behind an anticipated first responders’ recognition banquet in 2018. Meade Bridgers Horne was born in Durham, North Carolina, in 1940. Her father, a native of Tarboro and a Navy man, would bring Meade to Tarboro to visit. The family’s travels instilled a love of the arts and its history. Mrs. Horne attended high school at The Madeira School in McLean, VA, and graduated with a Bachelor of Arts in Greek from Vassar College and a Master’s in Arts and Classics from Johns Hopkins University. In her early career, Mrs. Horne was a researcher for a Byzantine scholar and later became a letter writer for United States President Lyndon B. Johnson. Following, Mrs. Horne would found Edgecombe ARTS and spent over two decades bringing various forms of culture to Edgecombe County through her work at the Arts Council. As director of the Arts Council, she created displays at the Blount Bridgers House Museum, sharing her family items to help tell the story of Edgecombe County. She also helped found the Great Tarboro Bazaar, an annual art show, and sale, and wrote “The Poet’s Palette,” a biography of local artist Hobson Pittman. Mrs. Horne was a member of Preservation North Carolina, the Federation of North Carolina Historical Associations and was a founding member of the Phoenix Historical Society. She sang in the choir at Calvary Episcopal Church for over thirty years. Mrs. Horne has two children: Alix Coolidge and Thomas Horne. efforts resulted in Rocky Mount receiving an All-America City Award in 1969. Lock from San Francisco, Abbott (now Pfizer) from Chicago, Texfi, Burlington Mills, Ilco Unican and Rocky Mount Instruments among others to create a robust economic base. To attract these firms, the city’s limited and aging infrastructure needed to be enlarged. The Tar River Reservoir was constructed, the wastewater treatment plant, the Tar River water plant and the area’s electrical system were all upgraded with funds from local bond issues that Mr. Minges helped to pass. In 1968, when Martin Luther King Jr. was assassinated, Mr. Minges brought diverse leaders together to hold prayer sessions throughout the community to promote understanding and cooperation. Strongly civic-minded, he was president of the Rocky Mount Chamber of Commerce and a member of several civic organizations, including the Civitan and Rotary clubs. The Minges family was a strong advocate for N. C. Wesleyan College, providing timely funds that later helped build the Minges Auditorium in the Dunn Center. He was a lifelong member of Trinity Evangelical Lutheran Church, a member of the Full Gospel Business Men’s Fellowship International and often volunteered with the FGBF prison ministry at Caledonia Prison. Mr. Minges and his wife, June Wharton Minges, had five children. Mr. Minges died in 2002. In 2013 Dr. Parker was honored to be inducted into the N. C. State University Mechanical and Aerospace Engineering Hall of Fame for his brilliant career in and contributions to the science of Mechanical Aerospace Engineering. He is also a Fellow of the NCSU Chancellor’s Circle. His expertise in electronics has had a far-reaching impact on us all. The computers in your home, the cell phone in your pocket are good examples of some of his work. Optical cables that transport intercontinental data and voice communications are another example. As the owner of JLP Consultants, he has lectured and consulted throughout North America, Asia and Europe on technical issues concerning the electronic industry. The Induction Banquet would not have been possible without the incredible volunteers and sponsors. D.J. Rose & Son, Inc.
Friends of Forest Pittman, Jr.
Friends of Jim Dickens, Sr.